These 15 tips will change your brewing game forever when you’re on the go. Driving, flying, hiking, camping… you name it, we’ve covered it. You’re off on your travels and keenly anticipating new experiences in new surroundings. But there are at least some home comforts you’d rather not leave behind, not least your favourite, perfectly brewed, made-to-your-exact-specification cup of coffee. It’s an essential part of your everyday existence, and the good news is it can go with you, wherever your journey takes you. After these 15 tips, you will know all the secret hacks for achieving the perfect cup whilst on your travels. If you’re enthusiastic about fresh coffee beans, then you’re probably used to getting your kit together when travelling. Your destination and means of getting there will determine what you can take. So, the first thing to think about is your method of travel and what equipment will be appropriate to take with you. If you are hiking or camping, you ideally want to take as little as possible. If you are taking a suitcase to a hotel or B&B, you may have more room to take your best brewing equipment. If you’re serious about the quality of your brew, skip the instant. Fresh grounds or beans will give you a much better flavour and fresher taste. If you’re making the effort to bring along your own coffee, then it’s an idea to take the best quality product you can. Whether you take beans or grounds is up to you, but make sure they have been freshly roasted. Buying from a local roaster who works in small batches will ensure you are getting fresh, delicious and high-quality beans. Enjoying a delicious cup of coffee is the perfect way to unwind on your travels, and savouring the freshest coffee possible is the perfect way to indulge yourself while you’re away. If you are very restricted for how much you can take on your travels, you may have to stick with the brewing device provided (perhaps a branded coffee machine). But, if you’ve got some extra room to spare, take your own brewing device to make sure you’re getting a delicious cup. Not only will this allow you to use your own coffee, but you will also benefit from being able to use your favoured method of brewing. For travelling, the Aeropress is a convenient and high-quality option. It is a lightweight plastic cylinder that brews a premium-tasting coffee in as little as one minute. A timer is a small accessory you can throw in your bag that will make a huge difference to your travel brewing routine. Timing how long you steep grounds for plays a big role in the end result of your cup. Too little time and you will end up with a weak, watery cup. Leave it too long and you’ll get an unpleasant, bitter taste. How long you should steep for will depend on the device you are using. Read our guide to coffee brewing methods to find the perfect brew times. Similar to the reasons for timing your brewing, measuring your grounds is equally important. Too little and you may get a weak taste, too much and your cup may be overpowering or too strong. Instead of relying on the cutlery provided by your accommodation, and risking it being inadequate, bring your own perfectly-sized measuring scoop. This is a convenient way to ensure you’re getting a high-quality and consistent flavour, no matter where you’re brewing. If you’re limited for space, you may choose to travel with your coffee in its original bag. This isn’t a bad option, as long as it’s sealed with a clip. However, the best method for storing coffee is an opaque airtight container. Factors such as sunlight, air and temperature can all affect the freshness and taste of your beans or grounds. They need protecting against these external factors, and this kind of container will do the job and make sure your coffee stays fresh for the whole trip. Once beans have been ground, they start to lose flavour and freshness. This is due to oxidisation, which, in simple terms, is the process of being exposed to air. Although it can take a few weeks for grounds to go stale, you want to make sure every cup is as fresh as can be every single time. Grinding your beans is the answer, and though it may require a little extra time and effort, it is worth it (in our opinion) for the outstanding results it produces. Just because you are travelling, it doesn’t mean you have to sacrifice quality, and there are plenty of mini-grinders available which are great portable options. If you are hiking, camping or have got a long journey ahead, a travel flask may well prove an essential part of your kit. New creative designs and patterns are brought to the market every day for travel flasks, but practicality is the most important feature when travelling. Look for a flask that is insulated, made from resilient materials and leak proof, like this Pioneer travel mug. 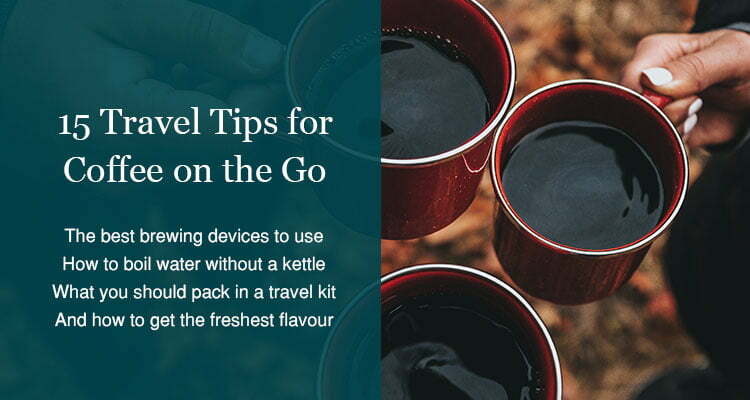 Depending on where you are staying, you may not have access to a kettle or boiling water. Or perhaps you don’t fancy the look of the grimy, rusty, 10-year-old kettle that your hotel has offered you. An immersion heater is a hygienic and convenient way of boiling water on the go. They are available in super small sizes that will fit right into your mug. The slight downside to using an immersion heater is that it requires more of your attention than a kettle would. Whilst it is switched on, it must be fully immersed in water, as any exposure to air will ruin the device. So, whilst it is boiling your water, it is a good idea to keep an eye on it, just to make sure it doesn’t rise above the surface. The moment you set off on your journey, you may feel you have already said goodbye to any idea of enjoying a homemade latte or cappuccino. But, if you have access to a French press and microwave, there is a simple hack that creates a luxurious frothy coffee. Pour some milk into the French press and plunge repeatedly to create plenty of froth. Then put in the microwave for a few seconds to stabilise the foam. Pour over your coffee to create an indulgent homemade cappuccino for a moment of relaxation on your travels. Although it may be tempting to throw your brewing equipment into your suitcase or just fit them into any empty space you can find, it will save you time and energy to bring along a kit bag. Firstly, it will keep your belongings nicely organised and easy to find when you’ve arrived at your destination in desperate need of a good cup of coffee. Secondly, it will provide some protection for your equipment and stop any coffee from spilling on to your other packed items. Using bottled water is another tip that may require a little extra effort but will drastically improve the taste of your cup. Risking the unfamiliar chemical balance of tap water when travelling could ruin your brewing efforts and produce a cup that is certainly not what you’re used to at home. The complications of hard water, soft water, magnesium levels and calcium content can all cause confusion and uncertainty when in an unfamiliar environment. Using bottled water when brewing is an easy way to get the best flavour from your coffee. This DIY coffee bag may be the simplest way to brew fresh coffee when travelling. All you need is some grounds, paper filters and a few minutes to prepare them at home for easy brewing on the go. Buy some paper V60 or large coffee filters (aeropress papers are too small). Cut into a teabag shape, making sure the sealed edge forms the bottom of the bag. To close the edges, you could add a few stitches or, as an easier option, use staples. Add in enough grounds for one cup. Fold over and seal the top and then add a piece of string. Place in a mug of boiling water and brew as you would with a teabag. If you’re staying away from home and are unable to take any coffee or brewing devices with you, there is a harsh reality you may have to face. You may have to drink whatever is provided, which could be low-quality, bitter tasting coffee. If you still need your caffeine fix but are looking for a way to improve the flavour, coffee syrups are a flavoursome option to create a much better tasting brew. Pour some into a little plastic bottle and take on your journey to get a delicious flavour in your cup wherever you go. If you’re an avid milky coffee drinker and don’t have access to a fridge on your travels, you may be panicked by the thought of having to drink black coffee for the whole trip. If you want to avoid using powdered milk, coconut oil is a convenient option for brewing when travelling as it doesn’t need to be stored in the fridge. It adds a delicious coconut sweetness, creates a creamy consistency and takes the edge off a strong cup of black coffee. Coconut oil also has many health benefits such as speeding up metabolism, giving your immune system a boost and increasing energy levels. Brewing & Drinking, Guides and Tips, How To Videos. permalink.